Do you think above point should apply to those so-called "Christian fundamentalist" preachers and their minions as well? Perhaps a charlatan is the more appropriate description of Peikoff just like those "Christian fundamentalist" preachers and their minions? E.R. Dodds' classic text The Greeks and the Irrational provides additional evidence that ancient Greek society was highly religious and (gasp) mystical. I wonder why Peikoff regards Plato and Aristotle as leaders of ancient Greek culture. Plato was a student of Socrates, who was put to death by Athens. Aristotle flourished after the heyday of Greek democracy, when Macedonia had conquered Greece. Neither was especially influential in his own day. The mystery religions (notably the Eleusinian Mysteries)were of far greater significance, and Peikoff would presumably regard them as dangerous mumbo-jumbo. Where did Ayn Rand or Peikoff say that Greek culture was only rational, or that Aristotle and Plato were /leaders/ of Greek culture? "Nor were they taken very seriously by the leading voices of culture, such as Plato and Aristotle. From start to finish, the Greek thinkers recognized no sacred texts, no infallible priesthood and no intellectual authority beyond the human mind; they allowed no room for faith." When Peikoff said that, he was either incredibly ignorant, or guilty of wishful thinking or both. Objectivism as a philosophy looks down on religion so much, that to admit that one of cultures it admires was religious, would make it hard for them to look up to them. Because, It means that it wasn't the "Utopia of reason," they would have liked it to be. BTW, isn't this interesting from LP: "For detail, I refer you to Aristotle, the preeminent representative of the Greek spirit." Even if Aristotle were a secularist or even an Objectivist, how would that make his point? Why does that make him the "representative of Greek spirit" when you have "religionists" such as Homer, Herodotus, Aescyhlus, Plato, etc.? Someone give me a list of their top ten fave philosophy books. There are smarties here and I need to make an x-mas list. I find it ironic that, looking back, Peikoff or even Rand could have admiration for an entire civilization; as opposed to merely using individuals as examples. Aren't the ancient Greeks a collective? 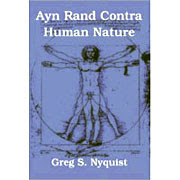 Isn't Objectivism counter-collectivist? What made the Greeks successful for their days seems to lie in their practices of constant warfare and innovation THROUGH warfare; and their use of religious imperialism to take in conquered enemies. That is...of course until they ceased to perpetuate themselves; and the Romans did it for them. If anything, Rome did more perpetuating of Greek philosophy and culture than the Greeks ever did. The book also talks about an Athenian man named Solon, who helped created a more just society. Solon lived from about 640 to 559 BC. Sure the ancient Greeks were flawed as are all people. Some of their flaws are mentioned in the quote above, and they also never got rid of slavery, or gave women equal rights. (Ironic given the fact that Rand, one of their biggest admirers was a woman, and all the Ancient Greek philosophers would rightfully be seen as sexist today) But based on the same source, couldn't it be argued that there is something about the ancient Greeks that is to be admired, or at least the Athenian Greeks? I meant to say that "All quotations are written in bold text" in the parenthesis. Sorry about the mistake. You can find individualists in every culture, not just the ancient Greeks. You can find inclusive (by the standard of the day) reformer like Solons in other cultures as well. You know, as good as these points are, it really baffles me into the late stage of seeing how far you will go to bash Rand that you would actually defend abhorrent negatives such a religion, just to show that Rand was some how less than perfect somehow intellectually.